First up is Emily whose research is on microbiology – micro meaning small and biology meaning biology. More specifically, she is looking at chronobacter sakazaki. It can cause meningitis or intestinal problems in babies and has a 40-80% mortality rate. It gets into the babies through powdered infant formula, although it should be killed if the formula is prepared properly. So, how do we detect chronobacter? Especially when it is often present in very small quantities. Firstly you do some non-selective enrichment to your sample. This gives a larger population of chronobacter so it will be easier to detect. Then you put it into a selective broth. Finally you put it onto a jelly-like plate and see what colour it turns. If it turns blue/green or yellow then you have some suspects. Then you perform either bio-chemical tests or use a DNA based method to confirm the presence of chronobacter. However, it turns out that these methods aren’t very accurate – they can be effected by both temperature and light. Instead a new DNA sequence based test is being developed. The genes that are sequenced are “housekeeping” genes. This is great for tracing back but doesn’t tell us much about how the bacteria behaves. 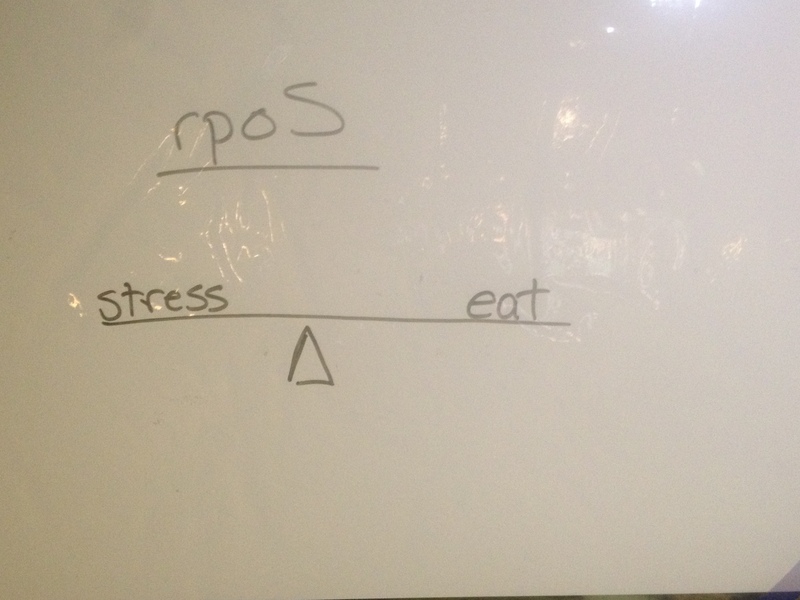 Although, you can discover things like RpoS, which is used to deal with stress. As it mutates, it can help the bacteria deal with a lack of food. To give an idea of how dangerous chronobacter can be; an outbreak in France in 1994 killed at least 8 infants. During the outbreak, multiple different sequences were discovered. With all we know, we still aren’t sure how the bacteria actually get into the infant formula. Heating the water properly when making the milk should be sufficient to kill the bacteria but chronobacter is still viable for up to 2 and 1/2 years even after it’s dried out. Key learning: you don’t get to name your own bacteria. Second up is Maxine who is a reformation historian, researching angelic belief. Specifically, did angelic belief have an impact on the change over from Catholicism to Protestantism? During Queen Mary’s reign, she had over 300 reformers burned to death. John Foxe wrote about these martyrs. There were four editions, deeply protestant, deeply political and full of angelic references. Foxe’s books contain significant commentary on a small number of sources of angelic intervention. It was felt that affirming intervention opened you up to ridicule from Catholics. However, they did still see a correlation/contrast between the hordes of angels and the minority of protestant believers. Foxe called his book Acts and Monuments and it was actually bigger than the bible and each of its four editions was bigger than the previous one. They would include interrogations of protestant martyrs and new editions would include counter-arguments to the latest catholic thinking. Where Catholics would see priests being higher than angels due to transubstantiation. Protestants believed that you didn’t need an intermediary. There are also examples of martyrs writing before they were put to death; “the angel of the lord will rock the cradle better than you or I ever could”. Here, describing how angels would look after their children. There was also an idea that angels were dispensers of divine justice, proof that God’s providential plan is just. Where Catholics would have a guardian angel for each day of the week, protestants would be more interested in an angel or armies of angels protecting England. They also believed that angels looked like people – you wouldn’t even realise that they were an angel until after they had saved you. The belief in Angels went all the way to the top in England – James I even had two angelologists as advisors. Key learning: Angelology predates the bible. Finally we have Wang looking at museums and architecture design. He thinks that both Emily and Maxine could be his clients as they both have stories to tell. Two hundred years ago architects began to design museums. By the ’60s and ’70s people no longer wanted the classic style of building. However, across this whole timeframe, the architect was just responsible for the shell of the building. Then the curators would come along and often end up having to do secondary construction as rooms were too big or windows were in the wrong place. Now architects design specific spaces to actually meet needs. Combining all three together, you can tell the full story. With the internet, do we really need museums? You come into the space to see the physical items. What will the future hold? Holograms? Whatever happens, the storytelling will remain the key. Museums should be an organic part of the city – how do people engage? Which ideas work in the space? How do you create communication? Key Learning: to see what Wang has planned for Nottingham Dinosaur Festival at Wollaton Hall, see the review of his SciBar talk on the Nottinghamshire BSA website.